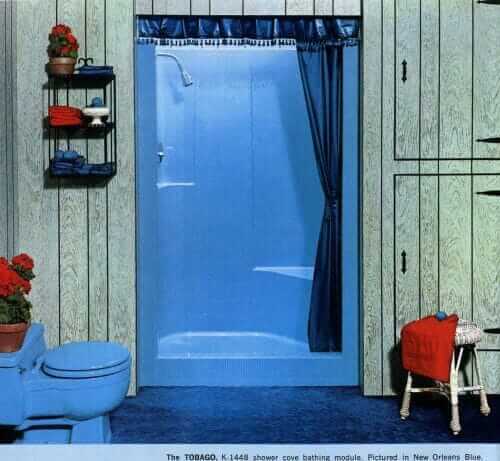 Home » Bathroom Help Category -- Also note those subcategories in the orange navigation, above! 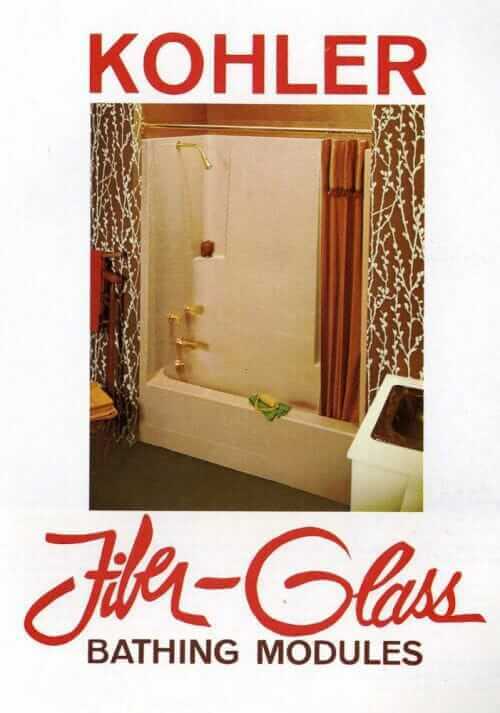 » sinks & vanities » 13 colors from Kohler in 1972 — gimme Tiger Lily, Antique Red, and Fresh Green, please! 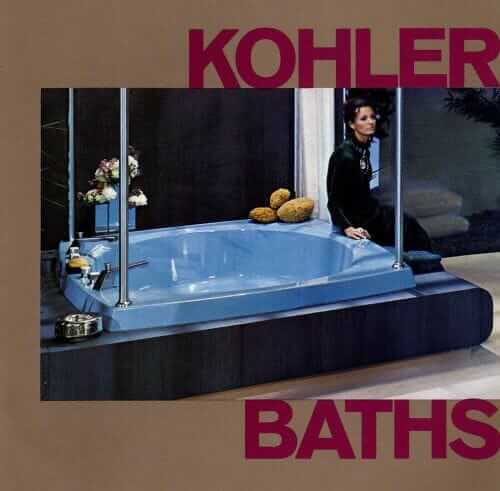 Kohler “Black Black”, new for 1972. 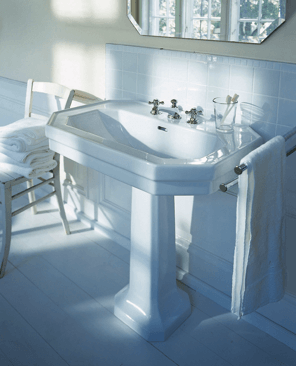 Above: My favorite, Tiger Lily, is shown in the “Trieste” kitchen sink. 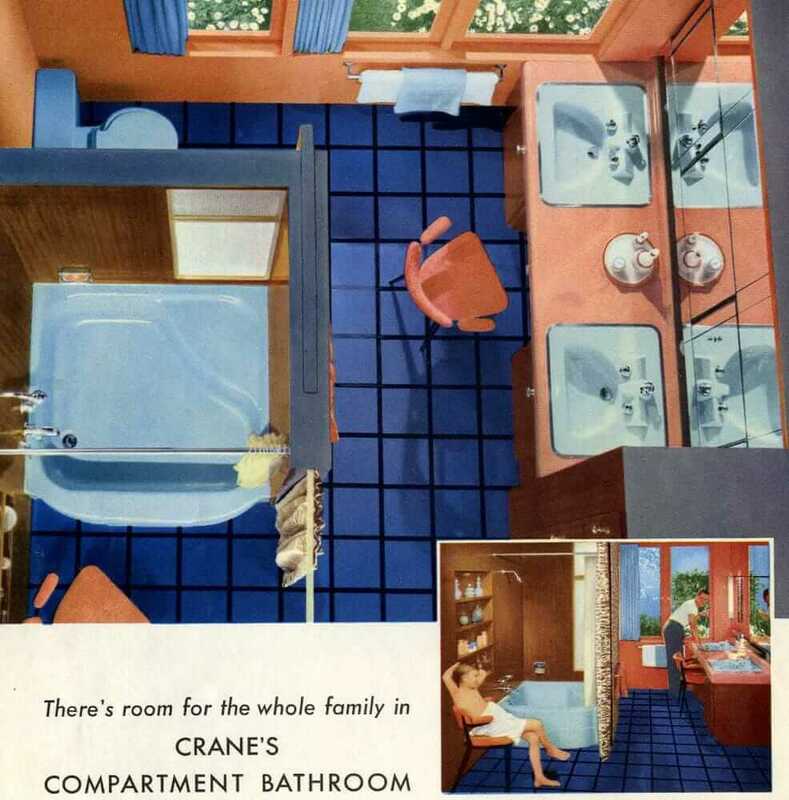 I also spy Coppertone on the “New Man’s Lav” and the “New Urbanite” sink is Harvest Gold. 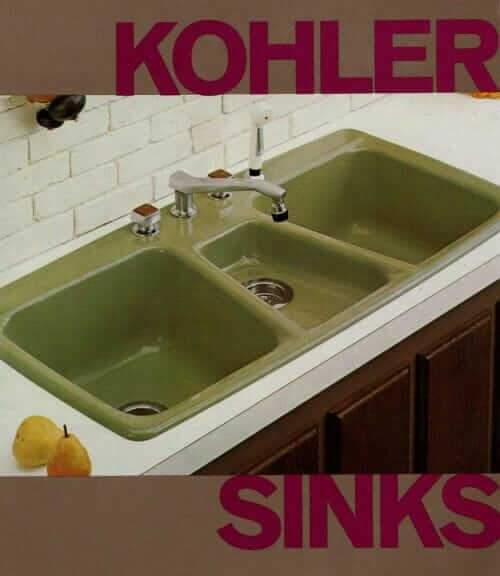 I wonder how many kitchen sinks were sold in this color in America? Tens of thousands? Hundreds of thousands? Avocado Green must already have been a phenom, because there were three photos of products in the catalog. 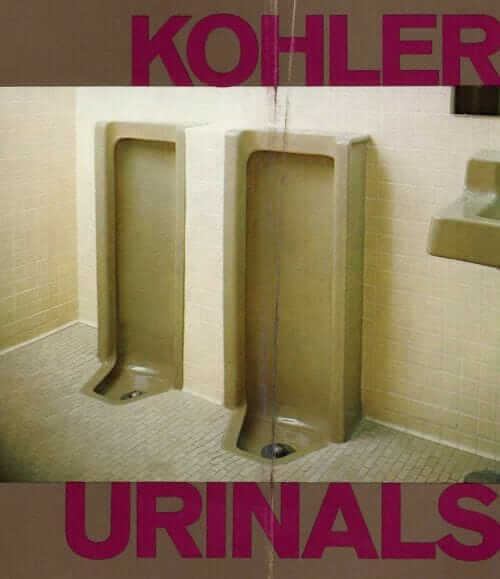 Including of: Urinals; no comment. 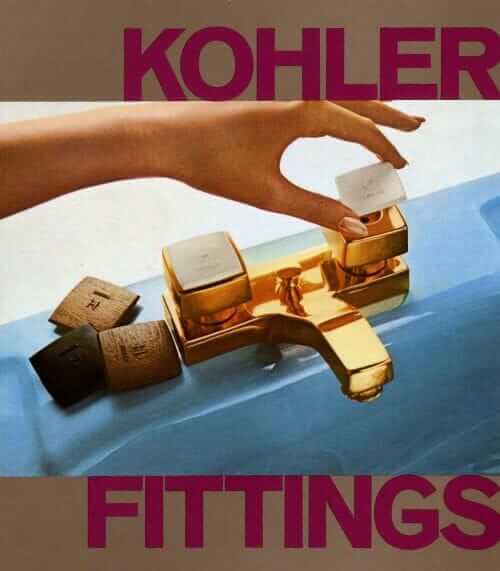 My catalog was mostly in black-and-white — it was a catalog for stores to order from, not a consumer-focused catalog. I’m featuring pretty much all the product photos in it. 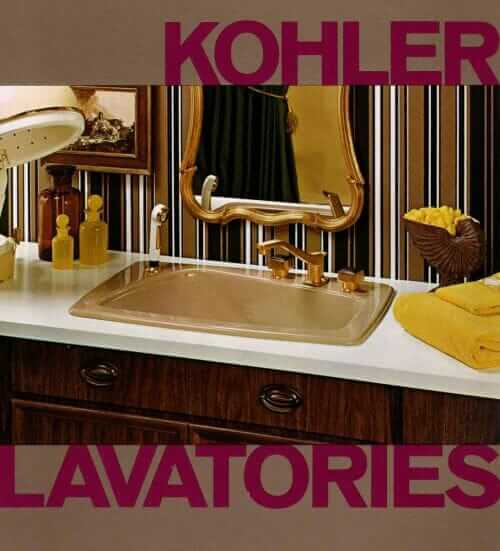 Above: That the Kohler “Lady Vanity” in Mexican Sand, I’m pretty sure. 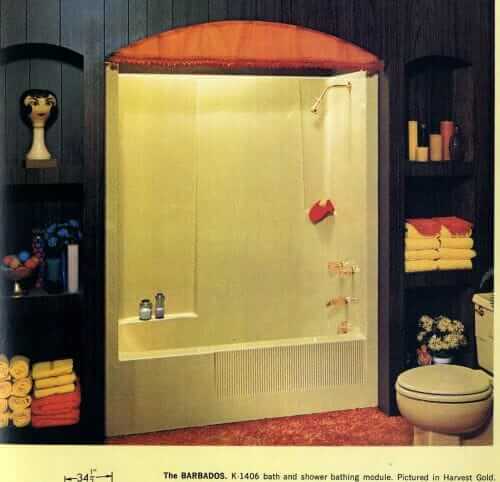 Those Lady Vanities — and their countertpart, the Man’s Lav, were awesome. Above: I think the three photos above are all Cerulean Blue. 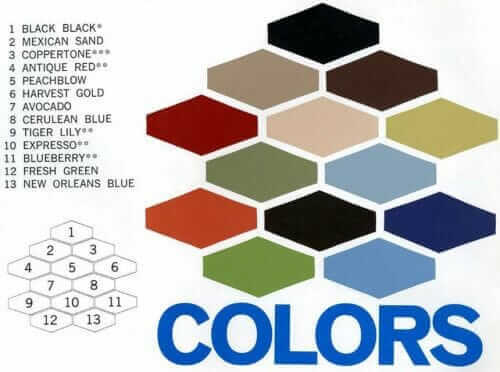 The color is not identified. Above: New Orleans blue is a deeper blue tnan Cerulean blue. The scan did not pick up the richness I see in the actual catalog image. Yikes, dig the poles — these were marketed as “stanchions” in sets of four. 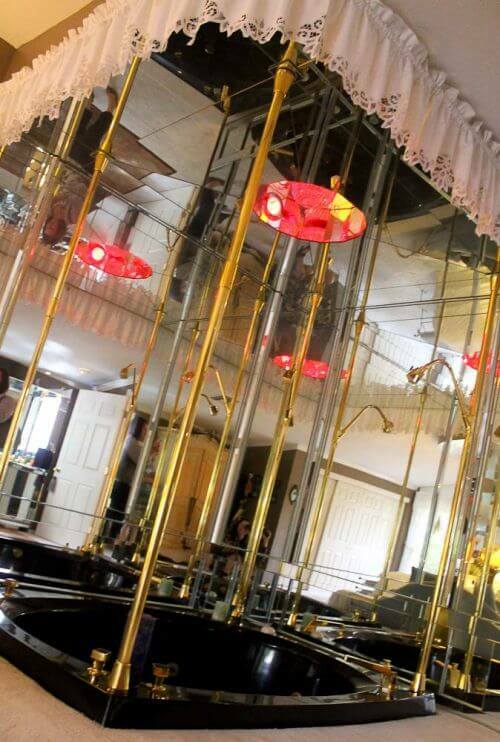 They included two stanchions with interior water tubing and shower arms. I visited then wrote about this 1963 ‘Showgirl Chic” Palmer Krisel house when I spoke at Las Vegas Home & History Week. 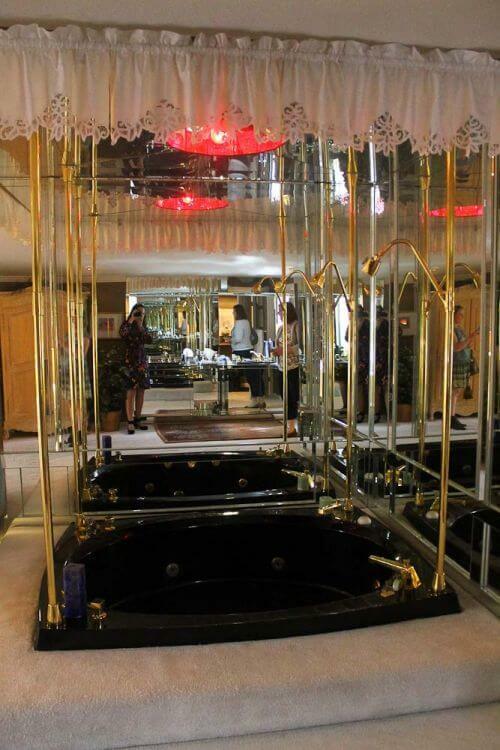 An incredible bathroom in an incredible house! 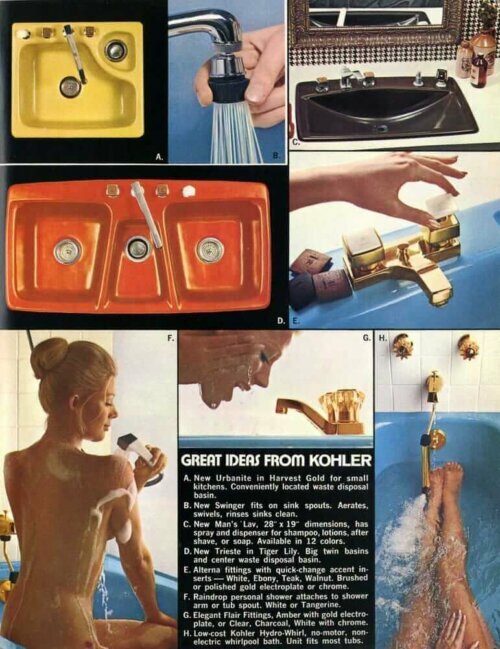 Back to the Kohler catalog: Peachblow shower insert… and a pair of bubblers. 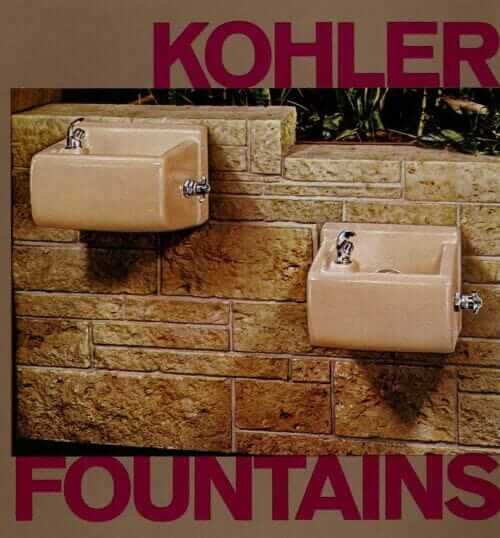 Yes, that’s what they call drinking fountains in Wisconsin, at least when I lived there many a moon ago. Harvest Gold. And a Stangl wigstand in the photo shoot — I had one of those but I… dropped it. Scrumptious, all of these colors. 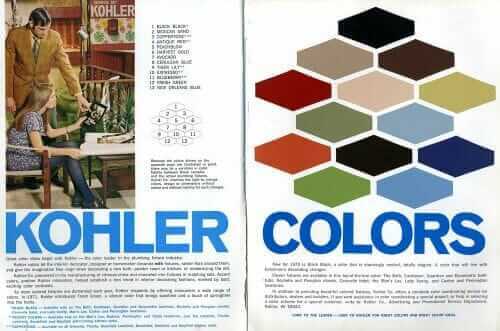 If you had a time machine, which color would you choose for your new split level house? We had relatives that built a gem of a house in 1975. It had two bathrooms, one on each floor. 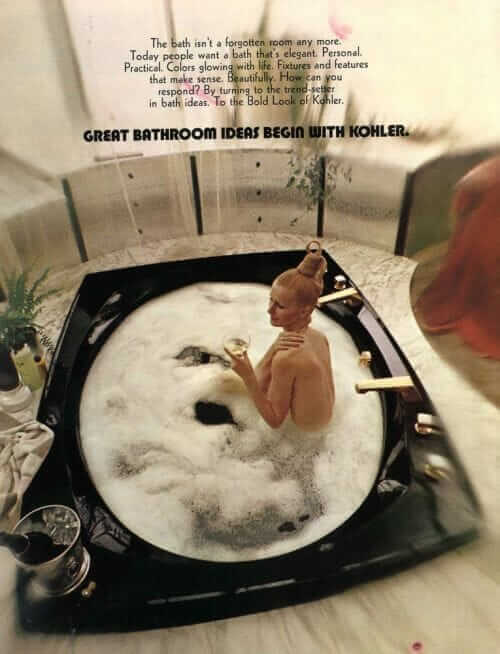 Both had the lady vanity sink. One bath was Mexican sand, the other was copper tone. One thing the woman hated was cleaning floors around toilets. 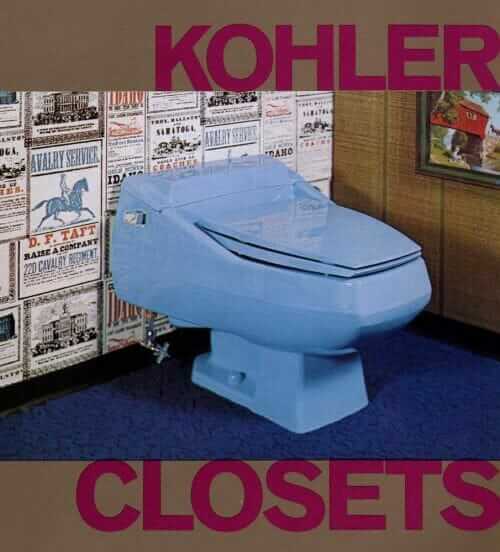 The solution was that Koehler made toilets that hung from the wall, rather than sit in the floor. This made it really easy to just swipe underneath. 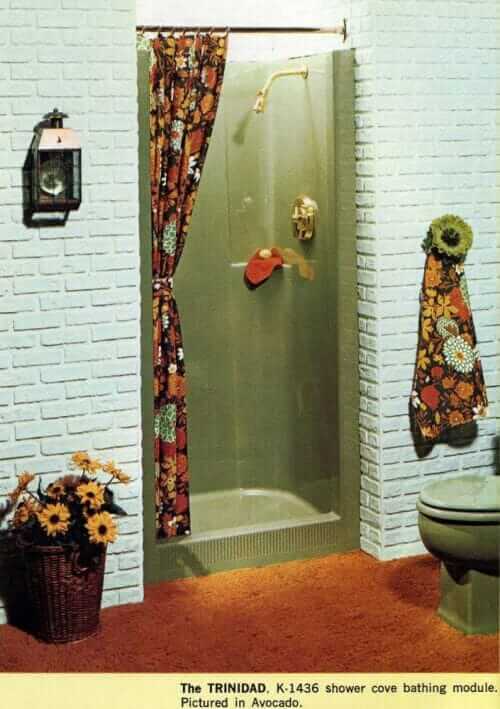 Sadly, the bathrooms were remodeled in the late 90’s by new owners and all that great stuff was thrown away. Have a fresh green triest sink in my garage right now with 2 round Tiger Lilly bathroom sinks. 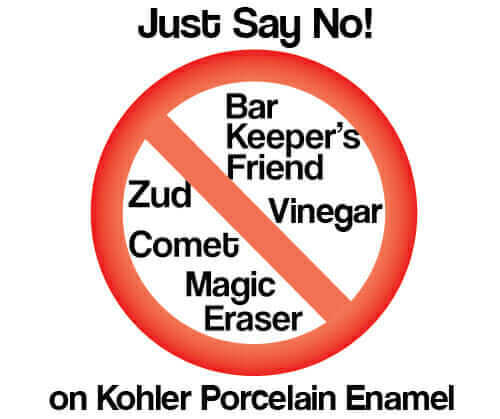 I just installed 2 oval in my master bath. All n/o stock.